I’m excited about my latest book Caverns Found. Most teenagers feel awkward about growing up and changing, but these four friends have even bigger problems. They are dragons. Or they might be dragons. Follow their adventures as they discover that growing up can be more complicated than they ever imagined. This entry was posted in Books, Books In Progress, Writing on May 12, 2015 by Sarah Wagstaff. Walter Haberton didn’t like to swim. He found the pool water choking. He couldn’t drown exactly, but his legs were so clumsy compared to his tail that he didn’t like to swim, while human. He did however, like watching Sienna Lancaster swim. She was in the pool every day from three to six. He walked a little faster. The snow fell around him the breeze making the snow reverse directions and fly upwards then down again. He turned the corner and started across the pool parking lot. A wall of solid glass rose in front of him. The indoor pool was surrounded by windows on this side. The snow was light enough that he could see through it to the interior of the pool. There she was in the lane closest to the windows. He could see her blue and green swim suit and her bright yellow swim cap. He watched the way her arms tirelessly pulled the water past her. She approached the wall and flipped, the water in smooth currents, flowed around her body. He caught himself standing. He turned and headed along the window. She kept pace on the other side. He slowed down a little, then hurried on, worried that someone might see him. His aunt had told him that it was important not to be noticed. Sienna rolled over and started her backstroke two laps early. There he was again. She wasn’t sure who he was, but she knew it was the same boy. He wore the same dark-hooded sweatshirt every day. She watched his back as he walked away from her. Sometimes it seemed like he stopped at the window and watched the swimmers for a second or two. He always walked home alone and always in the same dark sweatshirt. She looked for him at school, but there were too many boys who wore hooded sweatshirts to tell who it was. She had to concentrate on the upcoming regional swim meet. This was her second regionals and she had a reputation to uphold. She reached the wall and stopped. Kiley was waiting for her. “Are you already on your backstroke laps?” Kiley asked. She bobbed up and down, her hot pink swim suit, bright even through the water. “I saw that boy again.” Sienna said. “It’s just in your imagination. Race you!” Kiley yelled and pushed off from the wall. Sienna took a deep breath and followed Kiley, she passed her friend before Kiley even reached the middle of the pool. She was going to do fine for the swim meet, now if only Kiley would believe her about the boy. Walter Haberton loved history, at least going to history class. Mr. Mitchell told interesting stories, but even more interesting, was that it was his only class with Sienna. He wanted to talk to her. He wanted her to look at him and smile. He wished she knew his name. He sighed and went back to drawing on his notebook. Paper was fascinating to him. It was so smooth, consistent and flat. Nothing was that flat where he came from. He loved reading and was getting better at it, but he was still a couple of grade levels behind. His teachers in seventh grade had been shocked to find out that he could not read. They were lucky that he even spoke English. He should not have been able to even do that. Laurie Charleston, his new foster-sister, had been three years younger than him, and a non-stop talker. She followed him around the first three months ashore, talking continuously so that by the time he started school, he knew enough English to get by. Walter had been in several foster homes, before the Haberton’s adopted him four months ago, just before his sophomore year of high school. He drew a picture of his new mother’s face. He had memorized it the first time he had seen her. She had been different from his foster mothers. She wanted to be close; she wanted to listen to him. He had never been around a woman who cared about him that much before. He could tell from the first time he met her, the way her eyes filled with tears and she wanted to hug him, but waited until he offered. He picked up a fresh pencil. Using the tip he drew a miniature Sienna. He started with her heart shaped face, then he penciled in her high arching eyebrows, her full lips, and her dimple in her right cheek. The drawing was so small, it could fit between two of the blue lines on his paper. No one would know it was Sienna. He felt his diamond necklace through his shirt. He wore it on a leather cord around his neck. He never showed it to anyone. Even in the locker room, he left on an undershirt at all times. His pencil drew an angry dark X. He took a deep breath. “Walter?” It was her voice. He looked up to see Sienna standing in front of his desk. He tried not to gasp. He nodded. Sienna smiled and his heart melted. She handed him a paper. “I like your drawings.” It was last week’s history report and he’d drawn his mother on it, his real mother’s face. Sienna turned and continued handing out papers before he could say anything. He wanted to slump down in his desk and hide; instead he traced the line on his mother’s face with a dirty fingernail. He hated the dirt, but he hated tap water even more. Sienna sat staring at her history book. She could still see a picture of the woman’s haunting face, in her mind. The drawing had been so real, like a black and white photograph caught in a sketch. She knew nothing about Walter. How could he draw like that? Sienna smiled, she liked Brad Haycork, he was one of the sophomore class officers. Looking over at Brad’s table she only saw his empty chair. She looked over to see Walter looking at her. She waved him over to her table. He blinked then stood slowly. He was taller than he appeared slouched in his chair. His chocolate brown hair came to his chin. The hair swung in front of his eyes. He tucked it behind his ears. He came over and stood next to her desk. He looked at her, saying nothing. He shrugged. Did he ever speak? He was wearing a dark hooded sweatshirt. “I can for an hour after dinner, but I can’t meet at my house, our kitchen is being remodeled and Mom doesn’t want me to bring friends over.” She paused waiting for him to jump in. “We can meet at my house.” His voice was deep and quiet. He had the slight slur that she associated with her two Southern California uncles. “Are you from Southern California?” She felt strange not knowing anything about him. “Were you born there?” Did his eyes widen in fear? He reached a hand up to touch his chest. Then he lowered his hand again. “I’ll give you my address.” Walter said. Sienna handed him her notebook, and he wrote his address inside the front cover. His house was only a block or two away from the pool. He closed the notebook. His fingers lingered for a second on the cover. “Return to your seats, we’re going to continue on with fascism.” Mr. Mitchell announced. Walter turned and walked back to his seat. Sienna watched as he sat down. He gave her a half grin and then looked forward. 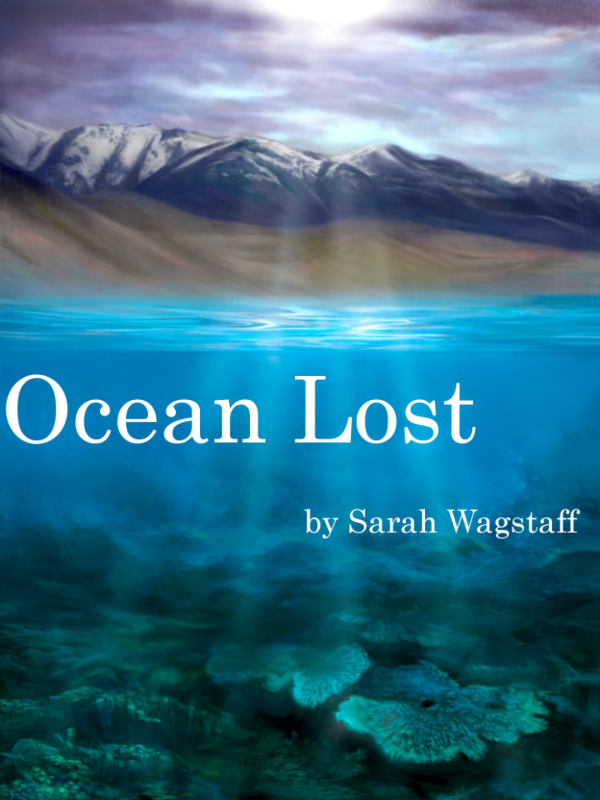 This entry was posted in Books, Ocean Lost, Writing and tagged Merman, Ocean Lost, Preview, Sample, Utah on November 30, 2013 by Sarah Wagstaff. I participated in NaNoWriMo. November is novel writing month. This is the second year that I’ve participated. My goal was to write 50,000 words in one month, that’s about 200 pages. I finished on November 30th with 50,065 words. I found it much easier to meet my daily writing goals this year. This entry was posted in Writing on December 7, 2011 by Sarah Wagstaff. I’ve joined a writing critique group, The Writers of the West. It’s been a while since I’ve been in a writing group. I’ve enjoyed having fresh eyes look at my Novikov story. This entry was posted in Writing on October 10, 2011 by Sarah Wagstaff. 2. Keep writing even if you aren’t published. Attend classes and keep learning. Don’t ever give up. One author had 500 rejections before she sold her first book and now she’s a bestselling author. – James Dashner – author The Maze Runner. This entry was posted in Writing on February 27, 2011 by Sarah Wagstaff.